Having a local version of your website on your computer is a good idea for a number of reasons. It can speed up the development process because you don't have to wait for broadband, and it allows you to test changes and additions to your website without impacting your live site. It’s also a great way to learn about WordPress, again without causing difficulties to the live version of your website. Most developers use local versions of websites while they’re developing and testing. Once they complete this process, they push the changes to the live server. WordPress cannot run on its own so you can't simply download it and install it. This requires you to create a server environment on your computer. This is called a local server, or localhost. To do this, you will need a software application. Several are available, including XAMPP and WampServer. XAMPP works on Mac, Linux, and Windows computers, while WampServer just works on Windows machines. This tutorial uses WampServer. 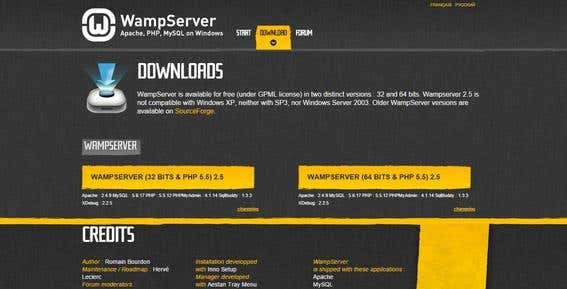 Download the installation file for WampServer from their website. Once it is downloaded, you will need to run it to install the application. Follow the instructions on the screen. In most situations, the default values will be okay. Once WampServer is installed, you should run it. This will put an icon into your taskbar in Windows. All WordPress websites have files and a database. The first thing you have to set up is the database. One of the great things about WampServer is that it uses phpMyAdmin to administer databases. This is similar to most hosting companies, which helps make the learning process easier. To setup your database, you should click on WampServer in your Windows taskbar. This opens up a menu. Click on phpMyAdmin. This will open a browser tab and phpMyAdmin will load. Note that you are working locally on your computer rather than on the Internet, even though you are using a browser. Click Databases and enter a name for your database. For security reasons, it is best to use a name that is not easy to guess. It is also best to use all lowercase letters with no spaces. Write down the name you have given your database as you will need it later. Once you have entered your database name, you should click Create. 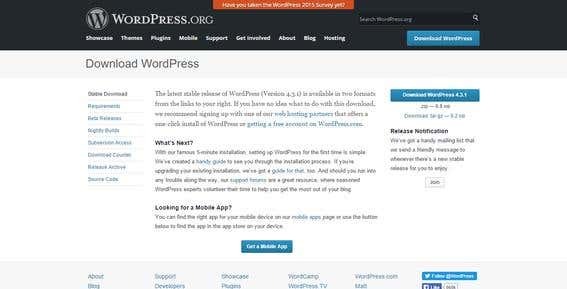 Go to WordPress.org and download the latest version to your computer. The file that is downloaded is a Zip file. Extract this file once it is downloaded. 5. Create a WampServer Folder for your website. In Windows, you should go to C:\wamp\www using file manager. Now change “www” to the name of your website (or any other name that you want). It should now be C:\wamp\YourWebsite. 6. Copy WordPress to this folder. WordPress download that you extracted should now be copied to C:\wamp\YourWebsite. Now go to your browser and open another tab. Browse to the address: http://localhost/YourWebsite/. When you go to http://localhost/YourWebsite/, you will get a message saying "there doesn't seem to be a wp-config.php file." · Username –enter your username. You can use letters, numbers and spaces as required. The settings that you use for username, password, and email are dependent on what you plan to do with this local version of your website. If you plan to move it to a live server on the Internet in the future, you should make sure these settings are accurate and secure. For example, don't use "admin", or something else that is easy to guess, for your username. And make sure you use a strong password. Once the installation is complete, you will be able to log in and start using WordPress using the username and password that you created earlier. You can do everything with a local version of WordPress that you can with a live version—install themes and plugins, customize it, and create pages and posts. If you want people to be able to see it, you will have to put it on the Internet on a live server. To move the local version of your website onto a live server, you have two main options—doing it manually, or using a plugin. Doing it manually involves creating a database on the server and exporting your local database to it, as well as using an FTP program to upload the files and folders. You will then have to change some settings to get your website to display properly. The option of using a plugin handles a lot of these processes for you. Two of the most popular are Duplicator and BackupBuddy. BackupBuddy is a premium plugin that offers a number of other functions in addition to being able to transfer a website from your local computer to a server on the Internet. This includes an automatic backup feature. Duplicator is a free plugin that's ideal if all you want is to push the local version of your website live.